C'est La Vie: Early morning musings of a highly emotive pregnant lady.. I woke up this morning when Kenny left for work, and my head was full of stuff that I really needed to write down. Thankfully, as it is 5:30 and I don't want to actually get out of bed yet, I can use the blogger app on my phone. I'm also trying to teach myself to type with my thumbs, but I keep going back to the index finger! I feel like a big geek since I can't type on my phone with my thumbs, but I think I just need to accept that about myself and move on. I have been so emotional lately. For instance, I was crying..a lot..at the end of Dirty Dancing when I watched it this weekend. I've watched that movie 100+ times and have never cried at the end. And poor Kenny..sometimes I will just be so pissed off, and he's like, "what's wrong? What did I do?" Most of the time he is innocent, and I'm just mad for really no reason that I can think of. It's just like all these emotions that I normally keep under wraps are just all breaking free now, which I know is due to the pregnancy hormones. I like having control of my emotions, so this is a difficult thing for me, but I'm learning that it's not so bad. Feeling all of those things and actually expressing them is very cathartic. I'm discovering that pregnancy really puts you out of your comfort zone in many ways, but being outside of your comfort zone is a very good thing for personal growth. One of the things that I have been thinking about for a long time, way before I became pregnant, is how I wish pregnant women wouldn't complain about their symptoms so much on Facebook. 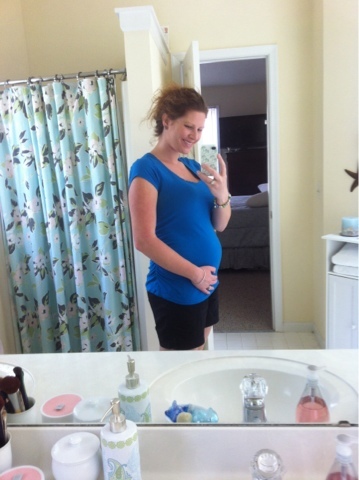 It is incredibly difficult to want to be pregnant and not be able to get that way. Very, very difficult. What makes it even worse is when you see people complaining about their pregnancies. Especially the ones that tried for a month and then conceived. I understand that the symptoms are not always pleasant, to say the least, but at least you get to have the symptoms. So many thousands of women are desperate to have those symptoms. I know this because I have been one of them. Kenny and I dealt with infertility for just a couple of years..for some couples, it's way longer and much more painful (and expensive)! Despite the anxiety that I feel, which is a lot, since I'm an anxious sort of person anyhow, I try to thank God every chance I get for this pregnancy. I know how much of a blessing it is, and I'm so in awe of this little life growing inside of me. We have our ultrasound next week, and I can hardly wait. The last time we saw the baby, he or she looked like a little gummy bear..that was 10 weeks ago. I don't care if it's a girl or a boy in there, I just pray that he or she will be healthy. And then I pray for the strength to handle it if something isn't right. We didn't do any of the first trimester testing that they offer, since we were going to continue on with the pregnancy regardless of what the results were. I don't judge those who choose otherwise..it's a very personal decision that is between the parents and God. Anyhow, we know that the baby has a strong heartbeat, and I'm starting to feel some movement..which has been amazing :) I'm just so excited to see our little one again! I also want to say how truly touched I was by all the people who have offered us congratulations and well wishes for the pregnancy. I have been especially moved by the sweet messages I've received from people that I haven't talked to in years. I cherish their kindness, I really do. I also have some amazing friends and family that have been so supportive and encouraging for so long now..if only everyone could be as blessed as I have been with their support network, the world would be a better place :) ok, well, that's all..for now!